Indiana is now among the states whose data is accessible through OnTheMap version 2.2, a Web-based mapping application from the U.S. Census Bureau's Local Employment Dynamics program. 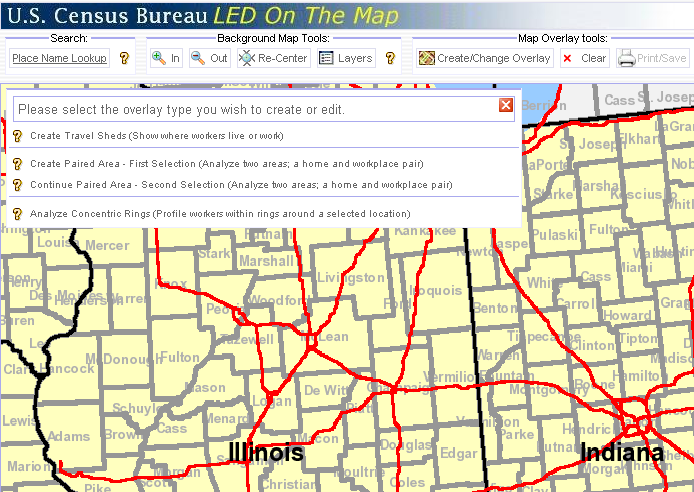 OnTheMap is a powerful tool with many uses. Users can zoom in to get neighborhood data not available elsewhere or zoom out to regional labor markets that cross state boundaries. This application, available at https://onthemap.ces.census.gov/, uses a standard Internet browser, but a high-speed connection is a must due to the large amount of data being processed. The data are useful (even if they seem a little old—2004 is the most current available), but because the interface is a little less than intuitive, some may overlook beneficial features. This article is somewhat of a mini-tutorial so you can get a jumpstart using this helpful tool. The first page of the website allows you to focus in on a basic geographic area. Once you're in the map interface, there are three ways to get data. Access these options by clicking the “Create/Change Overlay” button (see Figure 1). Create Travel Sheds: Depending on if commute shed or labor shed is chosen, this profiles either residents who live in a selected location (e.g., where do people who live in Marion County work?) or workers employed within a selected location (e.g., where do people who work in the downtown Indianapolis 46204 ZIP Code live?). Create Paired Area: This option analyzes a single home and workplace pair (e.g., how many Lawrence county residents commute to the city of Bloomington?). After you've selected an overlay, the next dialog box will ask you to define the selection area (among other things). Even though we're only going to look at layer selections in this article, the following four selection options are available, so users aren't necessarily limited to analyzing data for predefined geographies (see Figure 2). Layer Selection: Choose a layer type (such as counties, cities, townships or ZIP code tabulation areas) and then select a specific geographic unit on the map by dragging your mouse across it. *Tip: you need to drag your mouse across at least a portion of the geographic unit you want to select. Just clicking on it will not work. Buffered Selection: Builds a buffer around a line you draw on the map (you specify the radius for the buffer in miles). One of the improvements in this version of OnTheMap is that census blocks are used to define the selection area—excluding the freehand selection, which will continue to be defined at the block-group level. The same dialog box that asks you to define a selection area also wants you to specify a report type. The tables in this article provide the actual output from OnTheMap for various queries so you know what is available. Shed Report: If labor shed is selected, this report indicates where workers who are employed in the selected area live. As shown in Table 1, more than 60 percent of people who worked in the downtown Indianapolis ZIP code 46204 in 2002 lived in Marion County, but that number dropped to 55 percent by 2004. If commute shed is selected, the report indicates where residents who live in the selected area are employed. Area Profile Report: This report provides the characteristics of employed workers in the selected area. Figure 3 shows the map output for the Anderson and Fall Creek townships in Madison County. Table 2 provides the results of the associated area profile report, where we see that the percentage of residents employed in manufacturing dropped 2.5 percentage points between 2002 and 2004. QWI Report: This report provides 10 of the key quarterly workforce indicators. Table 3 shows these indicators for the census tract that will be home to the much-anticipated Honda plant in Greensburg. Paired Area Report: If labor shed is selected, this report provides the number of workers that are employed in selection area #1 and live in area #2, as shown in Table 4. If commute shed is selected, it provides information on workers that reside in selection area #1 and work in area #2. Concentric Circle Report: If labor shed is selected, this report provides information about people who work in each radius. If commute shed is selected, it provides employment information about those who reside in each radius, as shown for East Chicago in Table 5. Point size is based on concentration of workers, while thermals show density using a workers per square mile calculation. The number of workers/jobs in each quarter-mile grid cell is averaged with the numbers from the eight adjacent cells and then converted to workers per square mile. The colors chosen for the thermal overlay make it a little difficult to see what is going on, so it is useful to use that layer in conjunction with the points layer by selecting the “Both” option. To see the actual legend breaks for a specific map, click the square next to “overlay key” in the legend in the lower left corner. While the map gives a decent visual of commute and labor sheds, the real meat of this application is in the aforementioned reports, which will open up in a new window if you select the “Reports” option. While a bit slow and a little clunky at first, OnTheMap may prove to be an indispensable resource for data you can't easily get anywhere else.